Abstract—Nowadays, landslide phenomenon has become a serious problem in Malaysia. Landslide can cause human injury, loss of life and economical problem. One of the factors is due to the heavy rain. Hence, to overcome this problem, this study investigates a new method to detect spots of high water saturation which is integrated with a thermal camera system to provide early detection of landslide. The thermal camera is selected because it provides accurate predict where landslide going to occur. Thermal camera can be used to detect spots of high water saturation which is a key component that contributes to landslide activity. The analysis is done using 10 images. It was tested to see the accuracy of this technique. From the observation, this technique is quite accurate but still has their weakness and error. Index Terms—Landslides, thermal camera, morphological techniques, color thresholding. 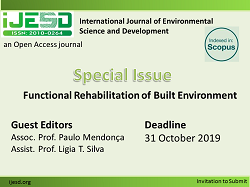 The authors are with the Electrical and Electronics Engineering Faculty, Universiti Malaysia Pahang, 26600 Pekan Pahang, Malaysia (e-mail: aufahuda@gmail.com). Cite: Aufa Zin, Kamarul Hawari, and Norliana Khamisan, "Early Detection of Spots High Water Saturation for Landslide Prediction Using Thermal Imaging Analysis," International Journal of Environmental Science and Development vol. 7, no. 1, pp. 41-45, 2016.